Algerian President Abdelaziz Bouteflika again defied mass protests calling for his immediate resignation, insisting on a plan to elect a successor only after a national conference and new constitution is approved. Bouteflika (82) last week bowed to demonstrators who say he unfit to run Algeria by reversing a decision to stand for another term. He stopped short of stepping down and postponed April elections, in effect extending his current term until a new constitution can be prepared. In a letter reported by Ennahar television, the veteran leader repeated an earlier plan for a national conference to reform the political system. The scenario broadly reflects a timetable for change Bouteflika mapped out on March 11. The ailing leader ruled for two decades but is rarely been seen in public since suffering a stroke five years ago. Demonstrators say Bouteflika is no state of health to run the country and want a new generation of leadership to tackle deep-seated economic problems and corruption. His comments were published shortly after Chief of Staff, Lieutenant-General Ahmed Gaed Salah, said the army should take responsibility to find a quick solution to the political crisis, the most overt signal of potential military intervention since demonstrations started. To date the army has remained in barracks during demonstrations, with the security forces monitoring mostly peaceful demonstrations in Algiers and other cities. The army generally wields power in Algeria behind the scenes, but has intervened publicly during pivotal moments. In the early 1990s, generals cancelled elections an Islamist party was set to win, triggering almost a decade of civil war that killed some 200,000 people. Bouteflika’s concessions last week brought no halt to demonstrations, expected to continue on Tuesday, Algeria’s Independence Day holiday. On Monday, doctors called for mass protests during the celebrations. Protesters are desperate for a new generation of leaders to tackle the country’s pressing problems: a stagnant economy and high unemployment despite vast oil and gas resources. In another concession, the Ministry of Religious Affairs informed clerics they are no longer required to submit texts of sermons to authorities for approval. One of the most influential clerics in Algiers expressed his opposition to government last week. 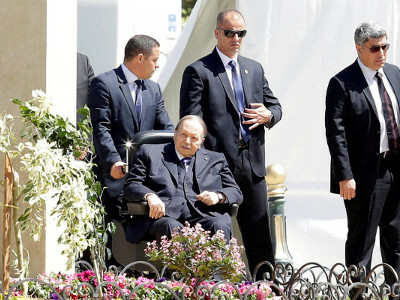 Since returning from medical treatment in Switzerland, Bouteflika has lost allies, including senior members of the ruling National Liberation Front party, known by its French acronym FLN. Bouteflika named a new prime minister last week, with leaders of 13 independent Algerian labour unions refusing to support his efforts to form a cabinet. Newly-appointed Deputy Prime Minister Ramtane Lamamra is expected to start a tour of some of Algeria’s main allies abroad to explain the new political roadmap, said a foreign ministry official. The tour will start on Tuesday with a visit to Moscow, Algeria’s most important military ally.